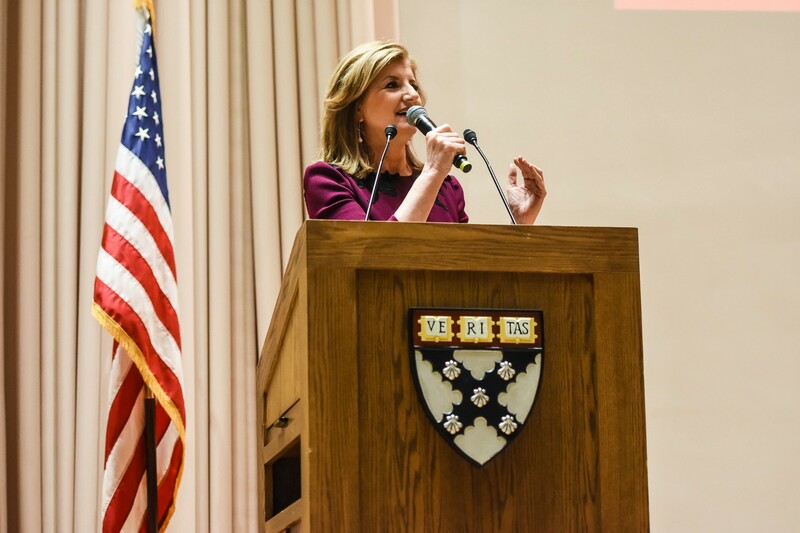 My speech from the Harvard China Forum. As Rui’s tragic and untimely death shows, the stress and burnout epidemic is a global one. But every country and region has its own traditions and tools to tap into combatting it. Of course, when China does something, it does it at scale, and the burnout epidemic is no exception. According to surveys, 42 percent of Beijing’s white collar workers say they are under a great deal of pressure at work. In 2015, stress levels of senior managers hit a new high of nearly 78 percent. And among the Chinese population generally, Gallup found that feelings of worry and stress have hit decade highs, with 40 percent saying they experience a lot of stress — an increase of 12 percent in just one year. And nearly 60 percent report having trouble sleeping. And of course, one of the things fueling this epidemic is technology. Right now, we’re at an inflection point in history where technology allows us to do amazing things, but it’s accelerated the speed of life beyond our capacity to cope. We all feel it — we’re addicted. In fact, that’s the purpose of much of it — to mine our attention and keep our faces glued to our screens as long as possible. There’s an incredible amount of powerful behavioral science behind that effort and it’s been very successful. We’re being controlled by something we should be controlling. And it’s consuming our attention and crippling our ability to focus, think, be present, and truly connect with the world around us and ourselves. As far back as 2008, China became the first country to declare internet addiction a disorder, far ahead of the United States. And across China, there are hundreds of treatment centers for internet addiction, which Chinese officials consider a serious public health issue. But while the stress and burnout epidemic in China might look much the same as it does here, China’s 5,000-year-old culture has many traditions that can help combat this very modern phenomenon. And what’s even more exciting is how much recent, cutting-edge science has validated so much ancient Chinese wisdom. It’s fitting for a country in which the very young and the very old are the most venerated. So while China has many challenges, the burnout epidemic not least among them, it also has many unique traditions particularly well-suited to meet those challenges. The Taoist tradition of yin-yang sums up exactly what we’ve lost in modern life: yang is going out into the world, achieving, conquering; yin is coming back to yourself and refuel. Also central to Taoism is the beautiful concept of wu-wei , which is literally translated as “non-action” or “non-doing,” but which in fact means effortless action. Because in Taoism, when we’re in a state of harmony, of grace, of being connected to ourselves, we move and operate in a dynamic, spontaneous way. It’s what in the West is known as a state of “flow,” defined as “the optimal state of consciousness where we feel our best and perform our best.” One way I like to describe it is: Life is a dance between making it happen and letting it happen. It’s the opposite of the stressed out, perpetually harried, fight-or-flight mode so many people around the world spend their entire days, and much of their nights in. That’s because entering this state of wu-wei, or flow, has never been harder in today’s world, with all of the buzzing, vibrations, blinking alerts and notifications. It’s never been easier to run away from ourselves. One tool to help withstand that onslaught is the Chinese tradition of Tai Chi. While it has its origins in martial arts, it’s practiced as a movement exercise that’s meant to help integrate the yin and the yang. Jack Ma, the founder of Alibaba, credits the practice with giving him, as he put it, “enlightenment on how things integrate,” and “how hardness and softness assist each other.” In fact, he says the entire operations of Alibaba encompass the philosophy of Tai Chi. And he’s carrying the tradition into the future, as well, with his 2H strategy, based on health and happiness. He even offers Tai Chi in their offices. Tai Chi is also one of the elements of the larger resource of traditional Chinese medicine, or TCM, which also includes acupuncture and meditation. Here, too, Western science is confirming ancient tradition. Meditation has been shown by researchers to lower feelings of loneliness among the elderly; to lower PTSD symptoms among soldiers; to lower the risk of depression; to allow people to increase focus; and to help people fall asleep faster. And here at Harvard the Medical School has found that the relaxation response — the state of calm produced by meditation and breathing exercises — actually switched on genes related to boosting our immune system, reducing inflammation, and fighting a range of conditions from arthritis to high blood pressure to diabetes. Not so long ago, meditation was still seen as vaguely new-agey and alternative. Now it’s hard to open the business pages without reading about it one more CEO or elite athlete embracing it. But the modern life might be cutting off even the Chinese from tapping into their own resources. According to a World Mental Health Survey done in Beijing and Shanghai, only 14 percent of those seeking medical help had used TCM services, even though China’s National Mental Health Work Plan, released in 2015, called for strengthening the role of TCM, especially in preventative care. Clearly the desire is there. China is also home to Xian’er, the world’s first monk robot, who can be found on China’s most popular messaging app, WeChat. And right now more than one million people are following him. The country is also currently undergoing a renaissance of Zen, and Chinese monasteries are answering the demand for after-work meditation sessions. And in a survey last year of Chinese travelers, Zen meditation tours were the second most popular option for getaways after jogging. If China can continue to tap into its many traditions, it’s poised to lead the way out of our culture of burnout. One of my favorite sayings from the Tao Te Ching is, “Water is the softest thing, yet it can penetrate mountains and earth.” This idea, that softness can overcome hardness, is vital and profound. It’s what Jack Ma said at the 2017 JP Morgan Alternative Investment Summit — in the future what will be more important than IQ and EQ is LQ: the love quotient. It’s the idea that humanity is more enduring than technology, that new paths can always be found around obstacles, including conventional wisdom and prevailing ways of thinking. Very modern problems are hitting China. But it also has some very old solutions. We have so much to learn from China. It’s a country rich in many resources, but its most valuable resource — and this one isn’t finite — is the wisdom it offers us to end the epidemic of burnout and stress.